You can add an additional charge to an existing invoice or group of invoices. First you must already have the income category created and the price set for which you wish to charge. *You could apply a negative charge to reduce an invoice amount. See Negative Income Price Use Caution. Go to Billing – > Batch Additional Charge. Select the category you wish to apply. Check the box. You may select more than 1. Find the open invoices who should have this additional charge applied.In the bottom table. You may filter for student, income category/item, amount, due date Check the front of the invoice to mark it for applying the additional charge. You may select one invoice or all. !Once a charge is applied you will not be able to remove it unless you delete the invoice and start over. 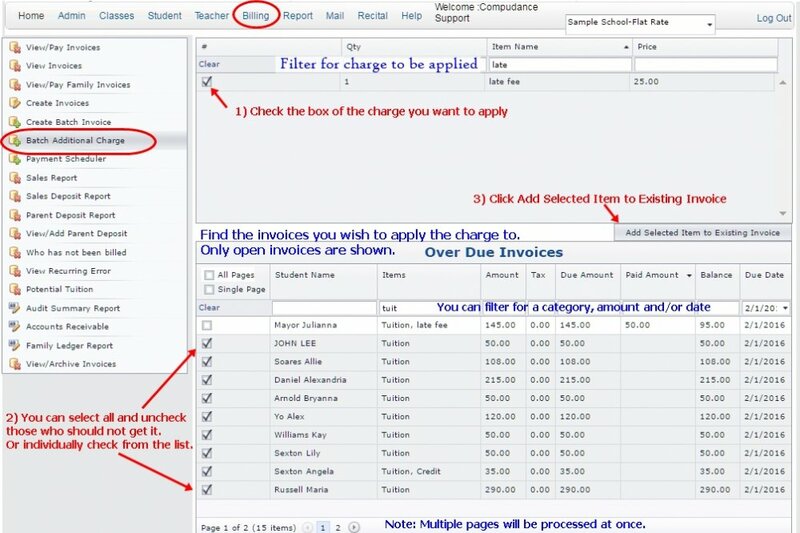 This feature can be used to change a tuition invoice after it is invoiced, especially if a class is dropped. We recommend you make a negative income category “ Tuition Adjustment- Class Dropped or Cancelled” or something like it. Do not edit the price of category “Tuition”.